Code review doesn't have to be this hard. so you can focus on making great software. At RBCommons, we provide simple, affordable, and secure Review Board hosting for teams of any size. Software bugs are the biggest source of major business problems in the world, causing hundreds of billions of dollars in economic harm every year. For those of us who create software, buggy code leaves a string of expensive schedule slips, death marches, and cancelled projects in its wake. Adding peer review to your development workflow can dramatically improve quality while cutting down on your development time and cost. Case studies routinely show that code reviews find between 60 and 90 percent of defects before they become expensive problems. Finding a bug early means it's much easier and cheaper to fix. Your dashboard gives you an up-to-the-minute overview of all the review requests you care about. See at a glance what's on your plate for today and what you've already covered. Filter down your dashboard by group, sort your review requests, and see what's left to review. You'll never miss a review request again. Your code is syntax-highlighted, for faster reading. We'll show you what function a line is in, what text has changed within a replaced line, and much more. Need more context? Expand the code up to the nearest function or class, nearest code change, or by 20 lines at a time. You won't have to dig through your editor to read the rest of the code. Moving some code around a file? Scrutinizing inserted/deleted lines is a pain. Instead, we'll show you if lines were moved without changing, and where they moved to. Every revision of a diff is stored. Quickly see what changed between diffs, so you don't have to go through the whole diff each time. 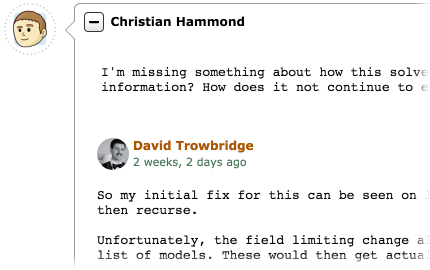 RBCommons isn't just about code. Drag-and-drop any file onto a review request, and your team can leave comments on it. Upload screenshots of your feature, or log output showing a unit test run, or a PDF for a feature spec. Anything can be uploaded and reviewed. Whether it's lines in a diff, or a part of an image, reviewers can leave comments quickly and easily. The specific area being commented on appears right there in the review. Comments can be added to code by clicking on a single line number, or clicking and dragging across multiple lines. You're not limited to one line, like other tools. Click and drag any area of an image to comment right on that section. Useful for discussing UI changes! 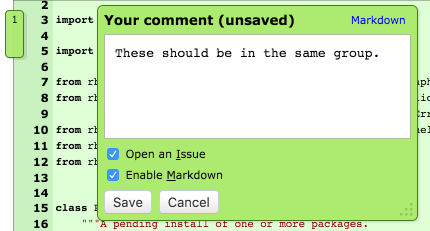 When people comment on something, they can mark their comment as an open issue. 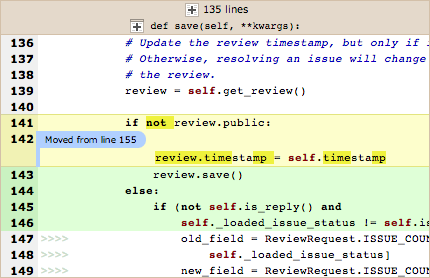 All open issues are shown on the review request, and work as a handy to-do list for the developer. Issues can be closed with just one click. Ah, the satisfaction of crossing items off lists. Large codebases are riddled with mysteries. Why is this line here? What did that line fix? With RBCommons, your entire development history is in one place. Each change's review request shows the entire development discussion and each iteration of the change that people have reviewed. A whole written history of your product. Our RBTools command line tools make it easy to quickly create review requests based on the changes in your source tree and to keep them up-to-date. We have a fully-featured REST API for any automation and integration needs you may have. Our Python API makes this easy to use. Our plans start at $29/month and come with a 30-day free trial.